If you need to send snacks with your kid to day camp, or keep a few treats or drinks cool for a day of running errands or an afternoon at the park, So Young Mother’s coolers are perfect totes. 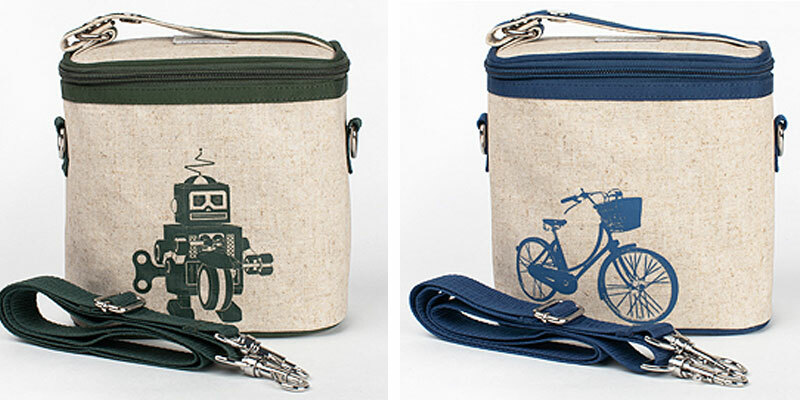 The small made-in-Canada cooler packs are easy for kids to wear as a backpack or messenger bag, and can be snapped onto a stroller, too. Kids will love their fun graphic prints like robots and butterflies. The linen coolers are PVC, phthlate, and lead free. Happy summer snacking! If you need to send snacks with your kid to day camp, or keep a few treats or drinks cool for a day of running errands or an afternoon at the park, So Young Mother's coolers are perfect totes. The small made-in-Canada cooler packs are easy for kids to wear as a backpack or messenger bag, and can be snapped onto a stroller, too. Kids will love their fun graphic prints like robots and butterflies. The linen coolers are PVC, phthlate, and lead free. Happy summer snacking!